The Cumberland & Dumfriesshire Farmers Mart P.L.C. 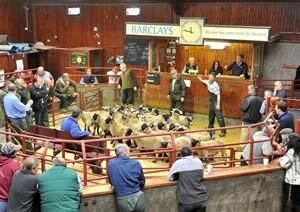 had forward 70 prime cattle, 30 over thirty month cattle, 1,541 prime lambs, 737 prime hoggs and 3,632 cast ewes & rams at their weekly sale at Longtown on Thursday 24th June, 2010. Clean cattle saw light weights sharper. Top price of 191.5p for a British Blue from J. Retson & son, Gardrum and purchased by Messrs Nattrass, Butcher. Limousin heifer from Gardrum sold to 188.5p and purchased by W. Kirkup & Son, Butcher, others 185.5p High Stenries, 182.5p, 179.5p Toppin Castle, 181.5p, 178.5p Dashwellgreen, 176.5p Hallburn and Dashwellgreen; Blonde d’Aquitaine 183.5p Dashwellgreen. Limousin bullocks to 180.5p High Stenries to Charles Kirkpatrick, others 172.5p, 170.5p Dashwellgreen. OTM cattle again met a fantastic trade for a great show of ¾ meat continental cows. Top of 123.5p for a Limousin heifers from Wanwood Hill who sold others at 115.5p. Limousin cows to 110.5p Ryehill, 108.5p Wanwood Hill; 108.5p, 107.5p, 105.5p Morley Hill, 105.5p Spoutbank, 101.5p Wanwood Hill, 99.5p Morley Hill; Simmental 109.5p Eden Farm; British Blue 105.5p Wanwood Hill; Friesian 87.5p Halltown and South Lambhill, 81.5p Halltown. Friesian bull 83.5p Halltown. Limousin cows to £856.38 Ryehill, £736.13 Minsca; Friesian £682.50 Halltown, £603.75 South Lambhill. A quality show of 1,541 prime lambs was forward and a full ring of buyers ensured the dearest trade of the week by far, averaging out at 180.7p per kilo. The sale was topped at 205p per kilo for Texels from Newington and to £89.80 per head for Beltex from Nunscleugh; Texel £87.50 Whins, £86.50 Corriefield; Suffolk £84.20, £83.20 High Wreay, £83.80 Guards Mill, £81.50 Lea Hill and Newbiggin; Greyface £77.80 Bankhead of Tinwald; Oxford £76.20 Guards; Charollais £74.80, £73.20 Rottington Hall; Half Bred £72.80 High Moat. The 155 light weight lambs sold to a top of £71.80 for Texels from Newington, £68.80 High Acres; Suffolk £65.80 Lydden Court; Jacob £59 High Acres; Cheviot Mule £58.80 Clonrae; Charollais £56.20 Tarnside House. A good show of 737 prime hoggs were also forward with well fleshed hoggs selling to extreme rates with an overall average of 136.3p per kilo. Top price of 173p per kilo for Cheviots from The Laythes and to £72.50 per head for Texels from Maidencoates and Effgill, £70.50 High End; Greyface £70.50 High End, £67.50 Black House; Hill Cheviot £68.80, £67.50 Whitchesters; Suffolk £64.50 Maidencoates, £62.50 Ringliggate Cottage; Blackface £65.80, £64.50 Plumpe; North Country Cheviot £64.50 Effgill, £62.50 Lowfield Cottage. A similar show of 3,632 cast ewes and rams were forward to the usual ring of buyers. Heavy fat ewes were easier on the week but good selling ewes and plainer sorts easily upheld recent high rates. The sale was topped at £128.50 for a Texel tup from Roachburn, others £125 Coytre; Suffolk £124 Coytre, £123.50 Spittal Hills, £122.50 Newbigging; Charollais £120.50 Newbiggin, £118.50 Coytre; Lleyn £104.50 High Stenries; Leicester £97.50 Coytre, £92.50 Spittal Hills; Rouge £83.50 Roadside; Bleu d’Maine £79.50 Roadside; Hill Cheviot £72.50 Instack, £66.50 Sorbie; Blackface £69.50 Longyester and Newbigging, £66.50 Maidencoates; Swaledale £66.50 Roachburn. Heavy ewes to £124.50 for Texels from Spittal Hills, others £118.50, £112.50 Severs, £108.50 Colter Coats; Charollais £118.50 Spittal Hills, £104.50 Newbigging; Suffolk £110.50 Spittal Hills and Stackbraes, £107.50 Severs; Rouge £97.50 Severs; Bleu d’Maine £93.50 Road Side; Beltex £92.50 Stackbraes, £80.50 Spittal Hills; North Country Cheviot £92.50 Upper Dounreay, £90.50 Kirkland Green; Greyface £83.50 Nunscleugh, £81.50 Longyester, £80.50 Coytre; Half Bred £85.50 Syke Farm, £78.50 High Moat; Clun £84.50 Croft House, £80.50 Croft House; Leicester £82.50 Stackbraes; Romney Marsh £81.50 Lydden Court; Cheviot Mule £78.50 Winterhope, £75.50, £73.50 Glenafon. Hill ewes to £80.50 for Cheviots from Stackbraes, £78.50 Cowgate, £77.50 Effgill; Kerry £70.50 Haytbwaite Lane; Blackface £68.50 Lonyester, £58.50 Haithwaite; Jacob £66.50 Stackbrae, £56.50 Kirkland Green; Swaledale £62.50 Broomhills, £61.50 Sockbridge Hall, £60.50 Dumblar Rigg; Kendal Rough £59.50 Haithwaite; Herdwick £54.50 High Aketon, £47.50 Kirkland Green; Beulah £49.50 Dairy House.